The Storm Surge Hazard Map shows areas of different inundations categorized as: 1-meter surges; 1-meter to 4-meter surges; and, 4-meter to 12-meter surges. The inundation coverage is estimated based on geomorphologic analysis and observation in the areas during interviews or surveys. The surge heights are computed. using the data gathered during the surveys in reference to the significant tropical cyclone occurrences and from storm surge model results. The tsunami hazard data is from Philippine Atmospheric, Geophysical and Astronomical Services Administration (PAGASA), 2008. 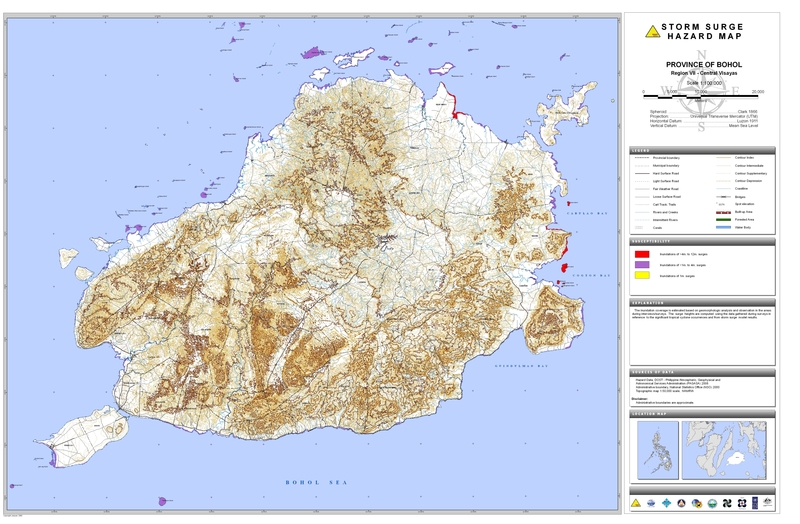 Administrative boundary is from the National Statistics Office (NSO), 2000, and the Topographic Map 1:50,000 scale is from the National Mapping and Resource Information Authority (NAMRIA). The Storm Surge Hazard Map was acquired from the Hazards Mapping and Assessment for Effective Community-Based Disaster Risk Management (READY) Project through the Philippine Institute of Volcanology and Seismology (PhIVolcS). Available in PDF or in JPG, this map may be downloaded and used for free provided that: a.) no alterations are made to the map; b.) proper citations be referred to the sources mentioned above; and, c.) all logos appearing on the map should also appear on your document.